For Expert Advice Call Our Sales / Technical Team On 0203 633 0827. According to industrial safety law, areas subject to hazardous noise must be clearly defined, and workers notified of the danger. In most industrial settings, the noise hazard will vary throughout the premises and employees are often mobile. 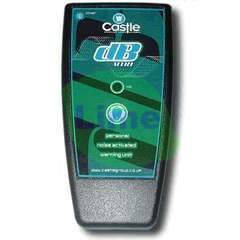 This is precisely where the Castle dB Alert! Personal Noise Activated Warning Unit comes into play. dBAlert! activates only when the noise exceeds a pre-set level, warning exposed workers that noise levels have become dangerous and to put on their ear-defenders. Perhaps more importantly for the employee, this means that they will also know when they can legally take them off! Being of rugged construction, dBAlert is suitable for most industrial situations. It comes complete with a pocket clip and the membrane keypad means that integrity and simplicity of use are maintained. dBAlert! also includes a vibrating alert , which gives the wearer the added warning of a mobile phone style vibrating alert to bring attention to the fact that dangerous noise levels have been exceeded. dBAlert! is a self-contained unit housing its electronics in a tough case, and is easily set-up to company specific levels meaning it will be ready for action within moments of leaving the box. The Ultra-bright warning LED is brilliantly lit when activated and is designed to catch the wearers attention by using their peripheral vision giving an easily noticed warning. • Vibrating Alert: Mobile phone style vibration motor for tactile warning (approx 150Hz). Simultaneous to LED warning. dBAlert is worn on a shirt or overall pocket with the microphone facing outwards. The microphone receives noise and passes it to the micro-processor, where it is compared to the preset trigger level which, if exceeded, starts the ultra-bright warning LED to flash. Once the noise in the area falls below the threshold for more than a preset time the LED is extinguished. The unit is factory calibrated to 85dBA and a series of internal switches enables the user to select the desired trigger level. We accept Official Purchase Orders from LEA schools, UK Government Departments, NHS trusts and Universities. If you wish to pay by cheque please select the relevent option during checkout. To pay by bank transfer / online banking please contact our sales department. Apr 19, 2019 (AB Digital via COMTEX) -- Noise Monitoring Market Synopsis: Noise Monitoring Global Market is set to strike a CAGR of 4% during the forecast period 2017 to 2023.